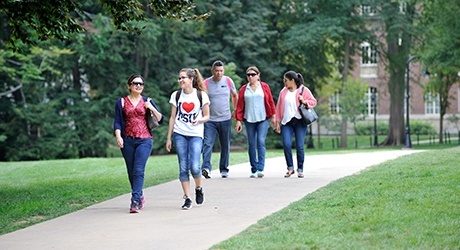 College visits are incredibly valuable — and can be incredibly expensive, especially if you live in the Midwest and are considering schools on both coasts. Depending on your family’s resources, you may not actually get to visit all the schools where you are planning to apply. Luckily, virtual tours and social media research can make you feel like you know a place inside and out. There are more than 4,000 colleges across the U.S. that offer 2-year and 4-year degrees. Whether you’re visiting in person or online, you’ll want to narrow your choices before applying. One way to narrow the field is by deciding which things are most important to you. Is it location? Big city or small town? Climate? (Don’t lie). Prestige of the institution? Degrees offered? Size of the student body? Average class size? Other considerations might be the Greek system, Varsity Athletics or intramural sports, theater, and arts programs. You name it, there’s a college that offers it. Once you know what you want, it’s time to find colleges that offer those features. To find colleges that have the features you want, go to naviance.com/solutions/higher-education. To compare the costs of attending the colleges you’re considering, go to collegecost.ed.gov. Creating a list of pros and cons for each option can be useful in deciding which school is the best fit for you. Deciding which college is right for you can seem like a daunting task, but this guide can help make your decision a little easier.